Manayi, A., Aliakbari, F., Hadjiakhondi, A., Omidpanah*, S. (2017). Effects of Ferula assa-foetida extract on spermatogenesis of rats. 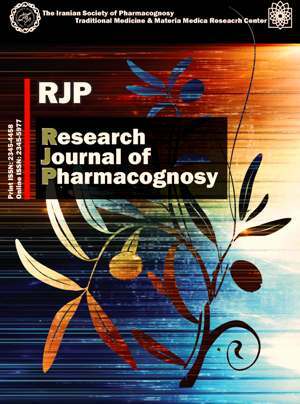 Research Journal of Pharmacognosy, 4(Supplement), 97-97. A. Manayi; F. Aliakbari; A. Hadjiakhondi; S. Omidpanah*. "Effects of Ferula assa-foetida extract on spermatogenesis of rats". Research Journal of Pharmacognosy, 4, Supplement, 2017, 97-97. Manayi, A., Aliakbari, F., Hadjiakhondi, A., Omidpanah*, S. (2017). 'Effects of Ferula assa-foetida extract on spermatogenesis of rats', Research Journal of Pharmacognosy, 4(Supplement), pp. 97-97. Manayi, A., Aliakbari, F., Hadjiakhondi, A., Omidpanah*, S. Effects of Ferula assa-foetida extract on spermatogenesis of rats. Research Journal of Pharmacognosy, 2017; 4(Supplement): 97-97. 2Anatomy Department, Faculty of Medicine, Tehran University of Medical Sciences, Tehran, Iran. 3Department of Pharmacognosy, Faculty of Pharmacy, Tehran University of Medical Sciences, Tehran, Iran. Background and objectives: Ferula assa-foetida is an herbaceous perennial plant which belongs to Apiaceae family. It is native to the east and central parts of Iran. This old traditional medicine has been used as antispasmodic, carminative, expectorant, laxative, sedative, stimulant, emmenagogue and vermifuge. In addition to the several therapeutic effects of the plant, it is known as an aphrodisiac herb traditionally; therefore, the present study has evaluated the effect of hydro-alcoholic extract of F. assa-foetida on spermatogenesis of rats. Methods: The seeds of the plant (500 g) were identified and extracted by aqueous ethanol 80% using maceration methods (3×48 h).Adult male rats (6 weeks) were orally treated with 50 mg/kg body weight of extract for 6 weeks. The extract was dispersed in distilled water. Control group received distilled water for the same duration. Some fertility parameters including sperm count, morphology and mobility of sperms with serum levels of testosterone, estrogen, luteinizing hormone (LH) and follicle-stimulating hormone (FSH) were evaluated using immunoassay methods. Results: Sperm parameters and levels of testosterone and LH were significantly improved in the treated group compared to the control group. Conclusion: The results revealed that extract of F. assa-foetida significantly (p<0.05) improved spermatogenesis in male rats through elevation of LH and testosterone plasma level.